In seventy-four essays, Rousas John Rushdoony emphasizes the necessity of viewing the Word of God as a law-word of the Sovereign for all of life and thought. 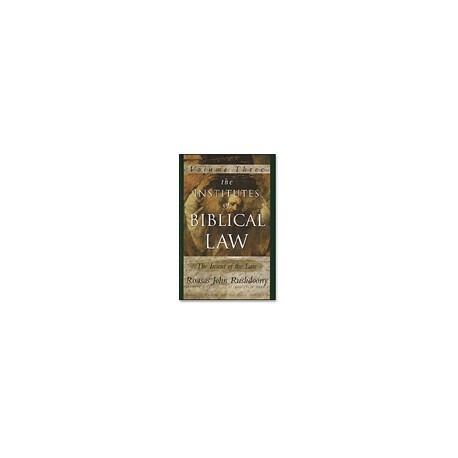 In The Institutes of Biblical Law , Rousas John Rushdoony emphasizes the necessity of viewing the Word of God as a law-word of the Sovereign for all of life and thought. He explains that God's law is much more than a legal code; it is a covenantal law that establishes a personal relationship between God and man. In section one, Rushdoony summarizes the case laws, tenderly illustrating how the law is for our good while clarifying the difference between the sacrificial laws and those that apply today. Then, in section two, the author explains the practical implications of the law, using striking examples that immediately capture the reader's attention. The third section shows that would-be challengers to God's law produce only poison and death. Only God's law can claim to express God's "covenant grace in helping us."